The Northern Rivers Rail Trail (NRRT) will be different things to different people depending on whether you like to walk, ride a bicycle or a horse, or drive a zero-emissions vehicle such as a mobility scooter, a Segway or an electric bike. It will also depend on whether you want to cover the whole 132 kilometres from Casino to Murwillumbah, or a specific section of the trail that appeals to your particular interest. You may want to walk or ride to work or school or just take a short stroll in your local area as part of your daily exercise program. The really outstanding feature of the NRRT is in answering the vexed question long asked in places like Lismore and Casino, “how do you draw the tourism dollars inland”? Those dollars are tantalisingly close by, but without a ‘Hallmark’ attraction that motivates tourism customers to visit and experience the product, those dollars may as well be elsewhere entirely. Herein lies the real economic value of the rail trail. It will form the foundation infrastructure that will allow entrepreneurs to develop the tourism and hospitality products that attract longer duration stays in the wider region and return greater tourism yields than would normally be possible. It could include sleeper-berth bunkhouses, a dining car and other railway themed attractions. It would feature strongly in rail trail publicity and would help raise Casino’s profile as a tourism destination. It would be up to innovative tourism and hospitality operators to capture the revenue by offering additional services designed to entice visitors to stay a while longer. A tourism package unique to Casino (that could be mass marketed in Brisbane or Sydney) could include; Rail travel to Casino with or without your bicycle, a famously friendly overnight stay with dinner and breakfast, a rail trail users guide and a self-guided tour of the attractions of Casino, designed specifically to expose visitors to additional spending opportunities. The NRRT could be the hallmark attraction that puts Casino firmly on the Australian Tourism map. The trail from Casino to Lismore may indeed be the biggest surprise. This is Australiana at its best, expansive vistas, and beautiful grazing lands, ample wildlife with xanthorrhoeas, big gums and a unique and spooky 200 metre long curved tunnel at Naughtons Gap. The Lismore Railway station and shunting yards could be central to developing a village atmosphere in Union Street to capitalise on rail trail traffic. A short diversion across the Wilsons River will bring trail users to the heart of Lismore, the shopping mecca right on the rail trail. The Carrington Street precincts and the “Art in the Heart” project could be the focus to entice trail users into the city. The Lismore to Bangalow section of the trail could be best described as the “Historic Villages” trek. Eltham in particular will be a highlight and an ideal spot for sampling the regional cuisine at the old Eltham Pub, an important social hub for the district. The landscapes on this part of the trail can only be described as sumptuous with verdant pastures, and shady tree-lined sections with century-old tunnels, wooden trestle viaducts and big steel bridges. These may well be the defining images of the NRRT, a palpable echo of history. Bangalow has always been a place of pilgrimage for those seeking beauty, tranquillity and community and today this vibe remains as a tangible characteristic. A new tourism position for this unique village as the starting point for the “Sprint down to The Bay” product will be a perfect fit for Bangalow. The railway station precinct could be redeveloped as the ideal staging point. This will possibly be the NRRT’s biggest earner. Tourism entrepreneurs will be rushing to offer packages for walking, skating and cycling (and possibly even segways, scooters and skateboards), bundling transport up from the beach and lunch at an attractive stopover point on the St Helena bluff with any other services that can best capture the business. With 13 kilometres of mostly downhill fun, this will become a signature experience of the Northern Rivers. Bangalow will also be the welcoming oasis for anyone doing the uphill journey. This rail trail would include an absolute beachfront amenity in Byron Bay, which is one of its unique selling points globally. Within the village, the rail trail will act as a spine to connect all of the existing cycleways and footpaths to create one of the most cycle and pedestrian friendly resort towns in Australia. This will encourage efforts to get Lennox Head and Ballina integrated into the network. The NRRT will advance the Byron Shire Council’s current Tourism Management Plan in regards to infrastructure development, product development, and sustainable development. With Ocean shores, New Brighton, South Golden Beach and possibly Brunswick Heads also connected into the network at Billinudgel, the whole of Bryon Shire could become famous as a destination leading a trend towards walking and cycling holidays. It would greatly enhance the branding and image of the whole region and provide a sharp point of differentiation for tourism marketing purposes. The trail between Byron Bay and Mullumbimby could be the most commuter friendly section. Mostly flat with some long straights, it will be invaluable for moving people around during the big events and it might also be suitable for year-round multi-passenger solar-electric shuttles. It could also double as a proving ground for new zero-emission, personal transport technology and a whole new industry in sustainable transport may spring up around it. The final 40 kilometres from Mullumbimby to Murwillumbah will be able to stand-alone. The villages of Burringbar and Stokers Siding will be revitalised as “boutique” with new hospitality and retail opportunities. Trail users will be in awe of the bio-diversity and mesmerised by the ancient landscapes. The Burringbar tunnel at over 500 metres long is the longest. Bats and glow-worms have claimed the habitat and limestone formations are appearing. These features combine to enhance the spectacle that waits at the other end as you enter the Tweed Valley. The ancient caldera, a geological and biological world wonder, will be one of the key features that further defines the NRRT as one of the world’s most spectacular and diverse rail trails. 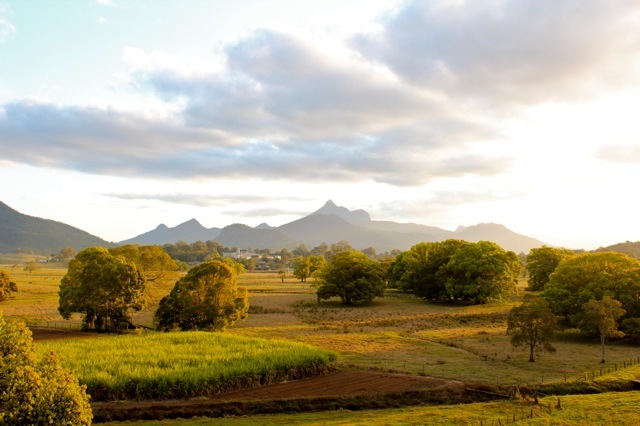 With Wollumbin a constant companion as the trail nears its conclusion, you will be drawn to our premier regional gallery, the Tweed River Art Gallery and the new Margaret Olley Art Centre. You can rest and take refreshments at a café with stunning views over the Tweed River; another of the unique features that will set the NRRT apart. Perhaps the most elegant of all the stations along the line is Murwillumbah. As an alternative “Rail Trail Head” for The Gold Coast and the Tweed, Murwillumbah Station would make a perfect reception centre. Coupled with an interactive museum of the natural and built environments including the 100 years of railway history, this facility would compliment Murwillumbah’s strong position on the NRRT. The 2 kilometre section between Murwillumbah Station and the Tweed River Art Gallery and Margaret Olley Art Centre will be a very popular short walk and highly marketable as part of a day tour from the Gold Coast or as a mobility scooter tour for the less physically abled. No other rail trail in the world is complemented by such an array of exciting features. Think Peru’s Inca Trail, Trekking in Nepal and India or walks in the French Pyrenees. Entrepreneurs could take this well proven formula and infuse it with Australian themes and concepts to produce a range of tourism products that could help to reposition our region as a higher yielding destination. The Northern Rivers Rail Trail would be Eco-Tourism in its purest form; it supports the environment, it educates, it entertains and it provides benefits to both the host community and the visitor.